So i decided to do a quick analysis on a random email thread. Here are the results. The original email was received at 11:09AM by Jon. Jon was asking if our group wanted to meet the weekend of Memorial day. An semi-important question effecting about 15 families. 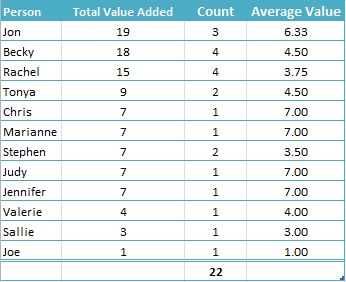 I decided to add an arbitrary Value Index Metric to each email in the thread. I included the notes used to determine the Value Index for each email. 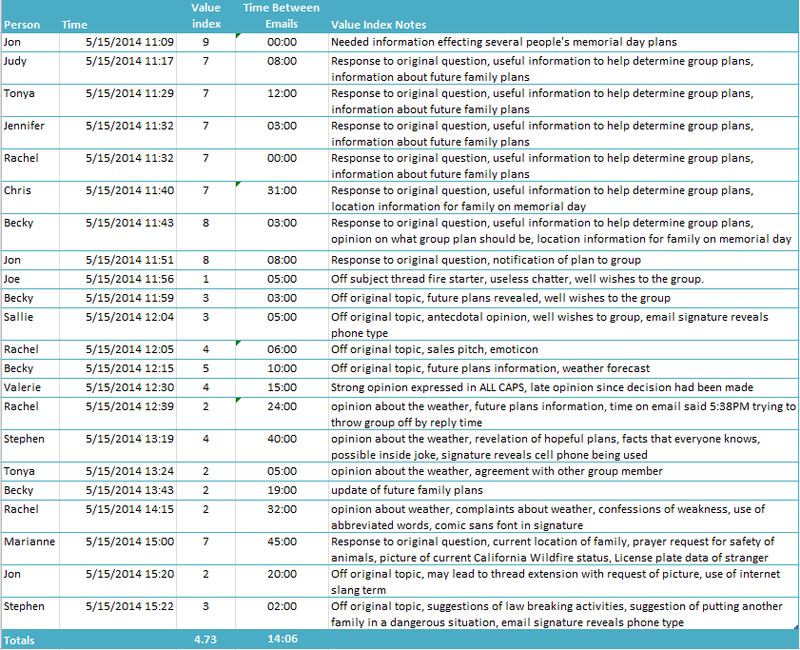 A total of 22 emails were analyzed. Value was holding pretty steady until the 5th item in the thread. This is when I decided to keep the thread fire burning by saying something completely useless. The thread would have died at message 4 had it not been for the thread fire starter mentioned above. Jon added the most value to the conversation. His first 2 messages were high scoring. His final message brought his Average Value/Message down 2 points. Chris, Judy, Jennifer and Marianne had the biggest bang for the buck by scoring an Average Value of 7 on a single message. Stephen's late message to the thread suggested activities that were potentially illegal and dangerous to another family's well being. These suggested activities were fun ideas involving speeding around in a rented red Corvette. Average time between messages was 14 minutes 06 seconds. Research shows that, on average, people spend 15-20 seconds reading an email. If you take the high side of 20 seconds and assume that all recipients of the email read all the emails in the thread, you would have 3.422 hours of read time spent on the thread. That is about 9.33 minutes per message sent!! This is a really rough ballpark. The 2011 median income for the United States was $50,054/year. Since the thread was in normal business hours we will assume a median working income of $25.03/hour income. There were 28 people in the thread which would equal $700.84 of median income per hour for the group. Multiply that by the calculated total hours of email read time of 3.4222 and you get a very rough $2,398.27. Now I understand that people make more and less than that and not everyone in the the thread works but my guess is that this value is actually a low end estimated cost compared to actual cost of the thread. Divide that by 22 (total messages) and you get $109.01 / per message sent. Again Jon wins the total value added award. He started strong with an on topic thread and an on topic response and took the lead for good with a final message requesting a picture of a Corvette. Chris, Judy, Jennifer and Marianne tied for best per message value with 7.00. Joe added very little value to the thread but was responsible for the continuation of the thread. If the thread would have died he would have scored a 0 on Value. You can see how quickly the thread cratered in value with Joe's Message. 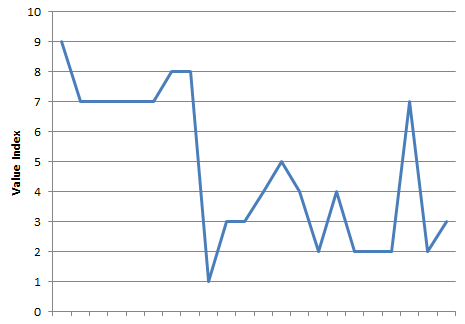 The chart also shows the late surge in value provided by Marianne. Somehow I convinced a couple friends to run Tough Mudder 2014 with me in Topeka Kansas last weekend. It was an awesome good time. They even admitted that they had fun. It is now the day after event and I am sore in places I was not sore yesterday. The Tough Mudder is another race in the long line of adventure races popping up all over the country. These races are very lucrative at the moment. I had wanted to run this race for a while but again it took me some time to convince some others to run with me. It is strongly encouraged that you run as a team. I could not agree more with this recommendation. Running this with a team was a lot easier and a lot more fun than flying solo. If you struggle to find someone to run it with then just sign up as an individual and then find a team to run with the day of. That was one of the coolest parts about Mudder. The camaraderie throughout the day and the event. Some of the obstacles are designed to require you to work as a team. There are a few individuals out there that could probably conquer the course running solo, but the majority of people will need help on a few of the obstacles. Our race was 10.9 miles long, and our start time was 10:00AM. 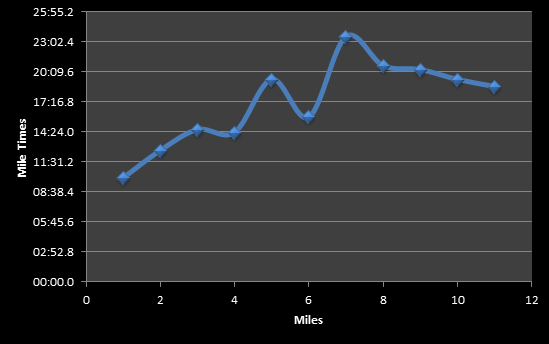 The first mile or so was just a flat run with no obstacles. We logged our best mile time of the day on this first mile. 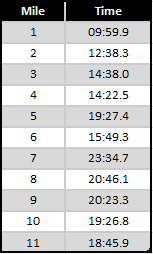 Since the course was tough and full of rocks and mud and stuff, the only metric I was able to record was our mile times with my trusty ol Timex. Maybe next time I complete one of these runs I will have some gear that is a little more rugged. Pole Dancer - What should be an easy 2nd obstacle. I immediately lost my grip and flopped face first in the cold water. This is where this shot was taken. My teammates brought my face flop up the rest of the day. Wish dude would have got a pic of it. Lumberjacked - Series of logs to climb over. Again needed a boost from teammates to clear this obstacle. You have to bear hug that log like you mean it. Creek Crusade - basically you run and jump over a creek. I knew I would probably roll an ankle here so I just powered through the creek like a grizzly bear would. 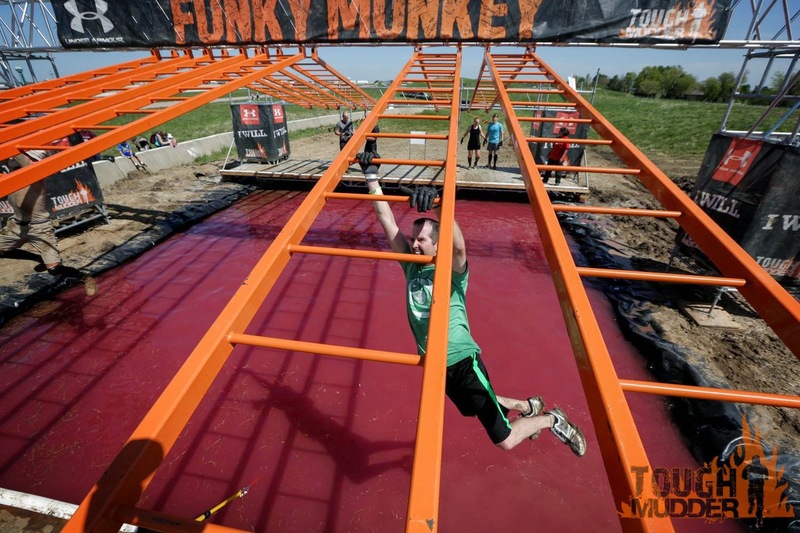 Funky Monkey - Monkey bars. I knew going in I would not make it all the way. I did make it about halfway up the first section. My main excuse is that one of my teammates kicked me mid air, but honestly I was done anyway. This water was cold! Killa Gorilla - A series of 6 back to back hills to run. Good times. PitFall - This obstacle was surprisingly more difficult than first thought. You make your way into what appears to be a big ditch full of muddy water, but under water is a seies of pits dug out that you cannot see. Each step you are dropping deeper or tripping over another pit. This obstacle also gifted you a shoe full of small pebbles to take on the journey with you. Walk the Plank - scurry up a wall to a platform about 25 feet high and jump into some cold water. Not sure if it gets more fun that that. This was one of my favorite obstacles. Electric Eel - stay low or get lit up by 10,000 volts. Watched some poor sap get hit about 10 times with the juice. Everest - Another one of those you need a helping hand to conquer this obstacle. You had to run your way up the side of a half pipe and hope that someone would pull you to safety. Mud Mile - In my opinion this was one of the toughest parts of the course. It was a series of 7 or 8 hills that you had to climb over. Between each hill was a ditch full of water of various depths. Fortunately it was not a mile long. This obstacle beat up my legs the most. At the end was a long mud slide that was fun. Just the Tip - You have to scale a wall with only your fingertips to grip on certain parts. I made it through the first easy section but fell off shortly there after. Starting to notice a pattern with my obstacle clearing (falling in water). Warrior Carry - One of my teammates hopped on my back piggy back style and I carried him to safety. Family Feud - Spectators threw these large balls on a rope at you while you tried to keep your balance on a balance beam. Yeah I fell off quickly. 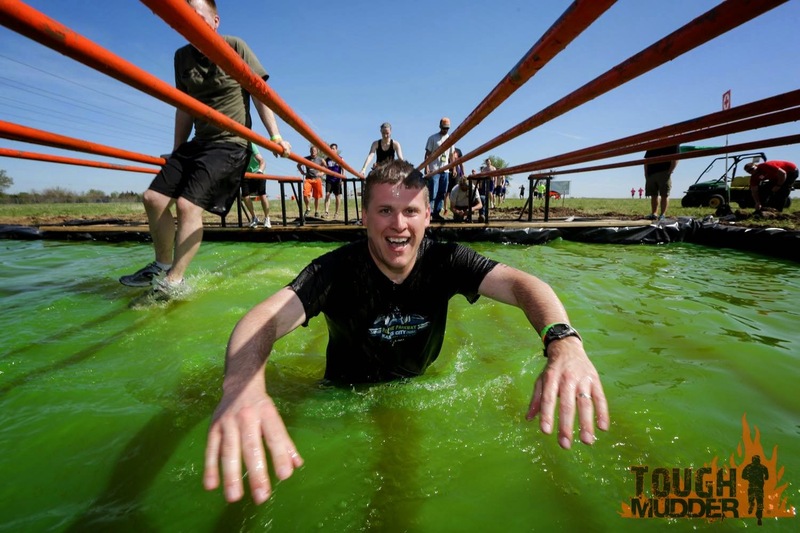 Electroshock Therapy - Surge through some mud and hay bales while getting lit up by 10,000 volts.